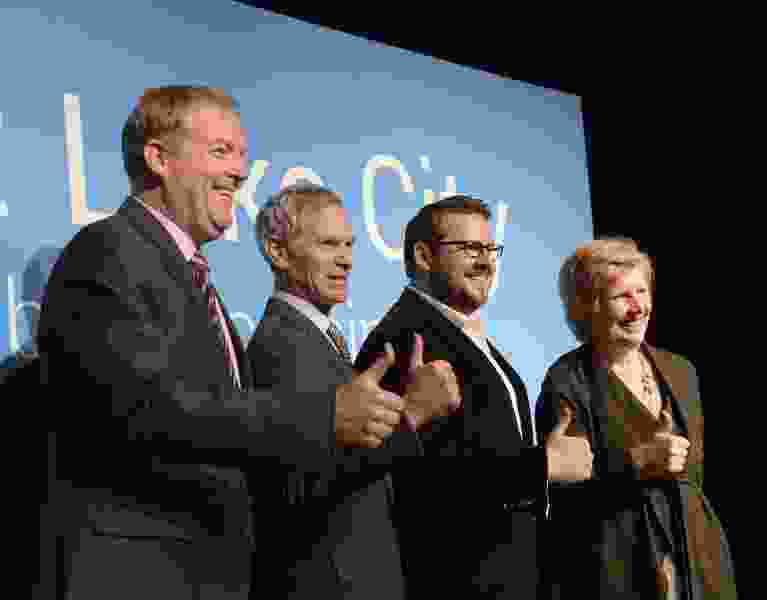 Al Hartmann | The Salt Lake Tribune Bill Hulterstrom, executive director for United Way-Utah County, left, Salt Lake City Mayor Ralph Becker, Google's Devin Baer, and Salt Lake City Council woman J9ill Remington Love give a thumbs up sign after announcement that Salt Lake City will be the next target city for Google Fiber, Tuesday March 24. Google plans to design and build a fiber-optic internet network across the city, ultimately giving residents and businesses access to gigabit Internet speeds. A slow wait gave way to blazing speed Wednesday as Google Fiber turned on its high-capacity internet services in Salt Lake City. About 18 months after it added Utah's capital to its favored U.S. cities, the Mountain View, Calif.-based technology company lit up a fiber-optic network in and around downtown and began seeking business and residential customers. This first phase of Google Fiber's rollout of web access with speeds of up to one gigabit per second — with optional television and phone services — covers roughly 112 blocks from 100 South to 800 South between 400 West and 1300 East. Nearly 200 government and business officials gathered Wednesday morning to celebrate the occasion at Google Fiber's newly opened facility, Fiber Space, a trendy customer-service center and internet cafe at Trolley Square mall. 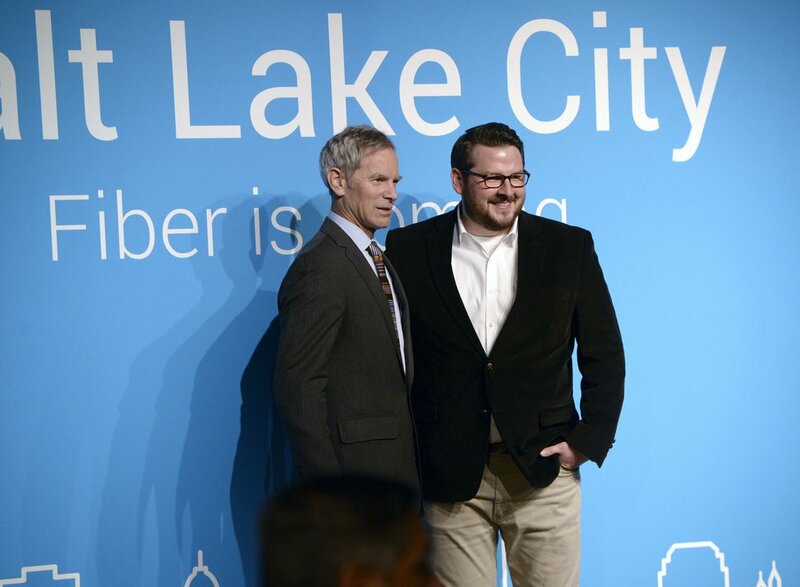 "As of 9 a.m., Google Fiber is live in Salt Lake City," Scott Tenney, head of Google Fiber business operations in Utah, told the crowd. The company simultaneously emailed thousands of prospective customers, saying access to its broadband capacity had arrived. Tenney said in an interview that other parts of the city would be turned on "in a matter of months and not years." He declined to provide specifics. "We're going everywhere as fast as we can," Tenney said. "This is a milestone, but not a destination." A spokesman for first-term Mayor Jackie Biskupski said city officials were "very excited" about the launch, with its promise of boosting economic-development efforts and helping extend internet access to lower-income residents through Google Fiber's initiatives to address the "digital divide." In that regard, Salt Lake City Council Vice Chairman Stan Penfold said Wednesday that the company had prioritized the west side in subsequent service launches. In front of a phalanx of TV cameras, Salt Lake City Council member Derek Kitchen ran a test of Google Fiber's impressive data transfer speeds, first by downloading a feature-length high-definition movie, then uploading 100 photos — both in a matter of seconds. When asked for his views on high-speed fiber optic web access, an awed Kitchen said: "To me, it's make-believe." Google Fiber sales people highlighted the prospect of crystal-clear video and an end to competing with family members for bandwidth. Google Fiber's parent company, Alphabet Inc., chose Salt Lake City in March 2015 after extensive courting by then-Mayor Ralph Becker and his staff. Utah's capital joined a list of nearly 25 U.S. cities where the service is live, under construction or in the planning stages, including Provo; Atlanta; Nashville and Chattanooga, Tenn; Kansas City, Mo. ; and Austin, Texas. The company will offer a slower Fiber 100 service of 100 megabits per second, or Mbps, for $50 a month, as well as its top-speed gigabit-per-second connection, called Fiber 1000, for $70 a month. Customers can add a 220-channel TV package to Fiber 1000 — including high-definition service and a nearly 2 terabyte-capacity DVR — for a total tab of $140 a month. Some popular TV content — such as HBO and the Pac-12 Networks — is available at an added premium. Phone service can also be had, for another $10 a month. Small and medium-size businesses can pay $70 a month for 100 Mbps, $100 monthly for 250 Mbps speeds and $250 a month for gigabit speeds. Google Fiber does not yet offer an enterprise-level package to larger businesses, Tenney said. Salt Lake City's initial launch covers thousands of businesses, homes and public facilities along with a significant share of the central and more densely developed business core. "There was a conscious decision made to start in the heart of Utah's capital city," said Jason Mathis, executive director of the business-backed Downtown Alliance. Mathis noted that Google Fiber's debut also coincides with an existing trend of companies relocating from the Salt Lake Valley suburbs to downtown. Fiber-optic capacity, he said, will be one more draw. "It's hard to know exactly what to predict," Mathis said. But judging from other fiber-enabled cities, "it seems to contribute to the magic elixir of urban life by accelerating the ability to communicate and collaborate." Much of the new service area falls in City Council District 4, represented by Kitchen, who said he hoped fiber service would strengthen efforts to recruit technology companies and other major employers from inside and outside Utah. Kitchen noted that other area internet providers such as Comcast's Xfinity and CenturyLink have upgraded their speeds and lowered prices in reaction to Google Fiber's arrival. The City Council has placed economic growth among its top priorities this year, along with upgrading roads and addressing homelessness issues. High-speed internet, Kitchen said, could provide a major tool in expanding business activity and spurring entrepreneurs. "There's just a lot of opportunity and a lot of potential with having Salt Lake become a fiber city," he said. "I'm eager to see what kind of investments we'll see flowing in." In terms of residential customers, Tenney said, single-family homes will require a visit from an on-site installer, while many apartment dwellers will be able to switch on service more simply. Google Fiber has taken advantage of a steep increase in apartment building in recent months, Tenney said, and wired a large number of new residential complexes during construction for easier access once tenants move in. In other cities, Google Fiber has extended free connections to public housing and partnered with the U.S. Department of Housing and Urban Development to bring connectivity to low-income children and families. It also has created "digital-inclusion fellowships" to help grass-roots community groups build digital literacy. The company has already sponsored inclusion programs with Salt Lake City Public Library and Utah Nonprofit Housing Corp. as well as Spy Hop, which runs after-school youth programs focused on digital media. Al Hartmann | The Salt Lake Tribune Salt Lake City Mayor Ralph Becker, left, and Devin Baer, Google's Assistant City Manager for Google Salt Lake City announce Salt Lake City as the next target city for Google Fiber, Tuesday March 24. Google plans to design and build a fiber-optic internet network across the city, ultimately giving residents and businesses access to gigabit Internet speeds.